Note: Do not wear glasses when using the Gear VR. Doing so may cause facial injuries. If you need corrective lenses, it is recommended that you wear contact lenses when using the Gear VR. 1. Align your face and the foam cushion and put on the Gear VR. Caution: Do not walk or drive while wearing the Gear VR. Always be aware of your surroundings while using the Gear VR to avoid injury to yourself or others. 2. 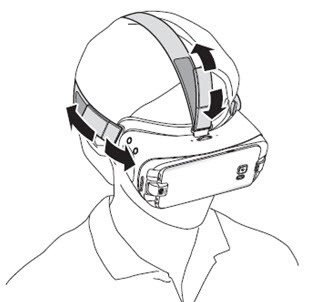 Secure the Gear VR to your head with the straps and place it comfortably over your face. 3. Adjust the length of the top head strap and the main strap. Note: The foam cushioning may get dirty and cause the foam cushioning to deteriorate. Ensure that you keep your face clean and dry when wearing the Gear VR. If the screen shifts to the left or right, check if the device holder is in the correct position. • Wear the Gear VR properly. If you wear the Gear VR tilted to one side, it may cause discomfort. • When the screen is tilted, adjust the Gear VR until the screen becomes clear. Caution: If you wear the Gear VR tilted to one side, it may cause discomfort. When the screen is tilted, adjust the Gear VR until the screen becomes clear.